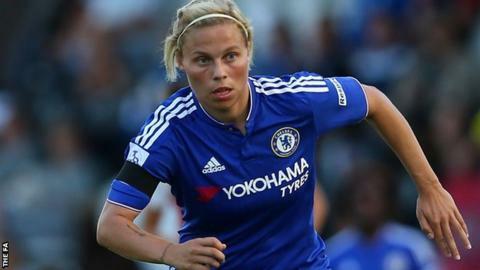 Chelsea Ladies defender Gilly Flaherty insists the pressure of trying to win a domestic treble was not a factor in Sunday's 1-0 loss at Birmingham City. The FA Cup winners were knocked out in the Continental Cup quarter-finals by Jo Potter's direct free-kick. Chelsea have a two-point lead at the top of Women's Super League One, with two league matches remaining. "We approached this cup in the same way that we approached the league and the FA Cup," Flaherty, 24, told BBC Sport. "It was something that we took seriously. Last year we got to the semi-finals - we wanted to go one more this year and get to the final. "If you are up there with the best, you have to accept that pressure. I don't think it affected us. "We weren't really at the game. Birmingham showed up and we didn't. "Don't take the credit away from Birmingham. They were the better team and deserved to get into a semi-final. "It's tough to break down that (defensive) wall. But we've got to find a solution because we might face it again, in the next two games in the league." Chelsea travel to Liverpool on 26 September, before hosting Sunderland in their final game of the season on 4 October, knowing that they will be crowned league champions if they win both of those games.